Diminutive truck enhances Ram’s Mexican product line. This little utility truck is new to the Mexican market. Considering that car manufacturers may push for product unity across different markets, the truth is that these very same companies know that certain products will only sell in specific places. Full-size pickup truck sales are largely confined to the United States and Canada, while tiny, car-based “utes” may see success elsewhere. 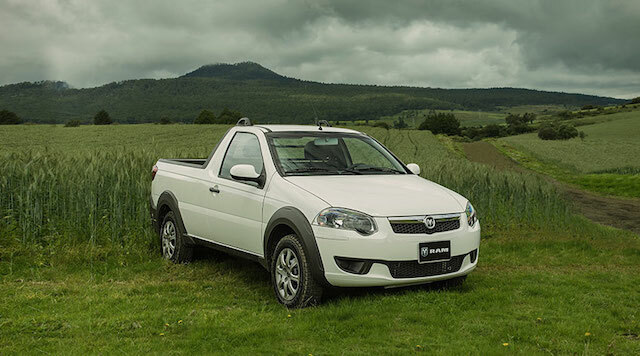 One product that we won’t see in the United States is the Ram 700, a compact pickup truck based on a Fiat design. The truck was recently introduced to the Mexican market, where it will augment Ram’s other truck lines including the familiar 1500 series. The truck is built in standard and crew cab configurations with a base price of approximately $13,656 for the two-door and $18,034 for the four-door. Those prices are based on the most recent Mexican peso to US dollar conversion and do not include the typical related delivery fees and taxes. Rear pivot back doors are available. The 2015 Ram 700 is powered by a 1.6-liter four cylinder engine making 115 horsepower at 5,500 rpm and 119 foot-pounds of torque at 4,500 rpm. Ram pairs this engine with a five-speed manual transmission. The truck weighs 2,577 pounds and measures 107 or 108.3 inches between the wheels, the longer wheelbase for the quad cab. The Ram 700 is 174.8 or 176 inches long by up to 68.5 inches wide and up to 64.9 inches tall. Its payload capacity is approximately 1,550 pounds. No, this vehicle is not suitable for towing. Fiat Chrysler builds the Ram 700 in Brazil and sends it north. 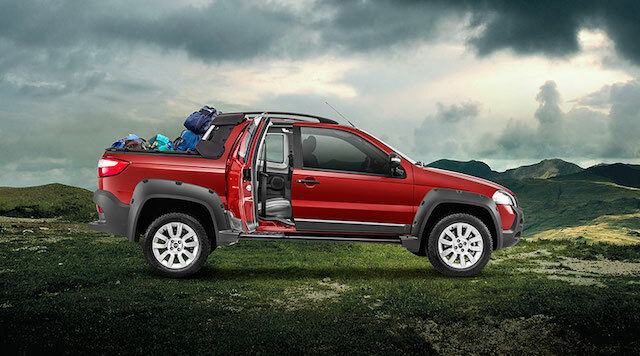 In Brazil, it is sold as the Fiat Strada and also competes with the Volkswagen Saverio and Chevrolet Tornado reports Allpar, an enthusiast site for Chrysler and Fiat products. Strada once represented a small Fiat car, but the name has been applied to the ute since 1996. What we know about the Ram 700 is limited, but in translating the spec and general information pages we know a few things about this model. The instrument panel features an overlapping four-gauge analog display with speedometer, tachometer, fuel and oil gauges. It also includes a driver information center featuring the odometer, time and outside temperature. Its audio system provides Bluetooth connectivity and includes an MP3 player and an auxiliary input port. The 700’s safety features include two front airbags, a collapsible steering column, reinforced doors, crumple zones and three-point safety belts. Exterior color choices include Alpine Red, Gloss White, Silver and Black. 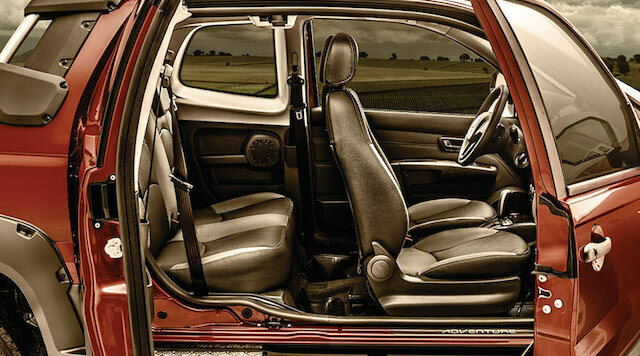 The interior has cloth seating surfaces with bucket seats up front and a bench seat to the rear in the crew cab. The standard two-door Ram 700 model. The 700 looks nothing like other Ram models and is absent the crosshair grille that is a brand staple. Clearly, this model is for the Mexican and other markets where the Ram brand isn’t as strong as it is north of the border. And it is for that reason Fiat Chrysler may pull things off with a tiny, front-wheel drive utility-type truck. As for the US and Canada, any truck smaller than a 1500 seems like a long shot. The long-rumored resurrection of the midsize Dakota pickup has largely been quelled by financial realities and Fiat Chrysler’s desire to support other brands, including Alfa Romeo. In any case, the Ram 700 has nearly zero appeal stateside, a market where even the smallest trucks are now midsize beasts. This ready for the market ute has a 1,550-pound payload. Photos courtesy of Chrysler Mexico.